The use of proxies is highly recommended if you don’t want to disclose your location when browsing the internet. There are some services online that are limited to people from specific regions, but using proxies can give you access to this services. If you are new to proxies, then this might be the first time you are hearing about backconnect proxies. The good news is if you learn how they work and how they can help you, you will certainly want to invest in them for the very first time. So, what exactly are backconnect proxies? 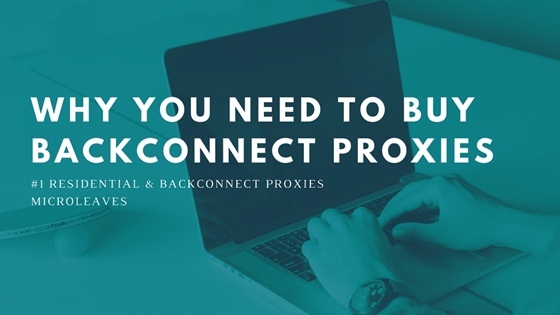 If you are familiar with the way normal proxy works then you won’t have any problems understanding how backconnect proxies work. Backconnect proxy works the same way normal proxy works. The only difference between this proxy and other types of proxies such as dedicated, private or shared proxy is the network that you are using. In simple terms, backconnect proxy can simply be defined as a proxy that gives you access to a specific gateway server that does not have any external IP address. The proxy here is generated from a different server and not the one that you are using to serve the internet. So, how exactly does backconnect proxy works? This type of proxy may appear to be complicated to some people but it’s actually easier to use than you can imagine. For example, if you want to change your location or your current IP address, using backconnect proxy will not only change your current IP address but also your referrer data every time that you send out a request. One of the reasons why you need to buy backconnect proxies is that it gives you an opportunity to make more than requests at once. Usually, if you try to make several requests from one IP address, chances are that your IP will be blocked and you will not be able to get the information that you were looking for. Top search engines such as Google, Yahoo and Bing have a limit on the number of requests that you can make per minute from your IP address. If you exceed this limit, you will have difficult surfing or take a long period of time before the pages that you were trying to access load. What’s more, your IP address might be banned from accessing various sites or even surf. This is where backconnect proxy comes in. Using this type of proxy will help you as it will appear as if you are trying to make different requests using different types of IP address. Another interesting thing about backconnect proxy is that it allows users to use different kinds of scraper software without worrying about rate limits. In fact, you can use as many scraper software as you want without affecting the power of your backconnect proxy. The good news is search engines will not be able to tell if all these requests are coming from the same IP address. If you are looking for the best way to protect your identity, location and IP address, you will be glad to discover that backconnect is more anonymous than the normal proxy. With this type of proxy, your IP address will keep on changing every time you surf. In this light, it will be difficult for search engines to tell what’s happening or track your IP address. Backconnect proxy is not completely safe but it is more secure and recommended than many other proxies. With this proxy, you can be certain that your personal details and sensitive data are safe from hacking. Backconnect proxy allows users to change the locations that they are currently in as well as the country. With this type of proxy, you can use IP address from several countries to surf the web. This means that no one will be able to tell where you are and what you are doing. However, it’s wise to note that some countries are more advanced and are therefore capable of detecting any suspicious activity. In this regard, it is in your best interest to note these countries and stay clear from using their IP address many times. Microleaves backconnect proxies work well with certain SEO tools such as Xrumer, GSA, Senuke, SER and many more. In addition, this is one of the proxies that allow users to use multiple IP addresses for a little amount of amount. So, if you are interested in finding the best type of proxy for your business, microleaves backconnect proxy is the best deal for you. This type of proxy will guarantee you increased levels of security and safety for your sensitive files and personal details. The truth is, they are somewhat expensive compared to the normal proxy, but they are worth every penny. If you are not sure about how to use them or even install them, don’t worry, all that work is going to be done by your service provider or the company that sells you the proxy. The only thing that you will be required to do is to set up an account and follow some simple instructions. In conclusion, you need to make sure that you are getting your proxy from a supplier that is reliable and reputable. Microleaves is an established industry that you can trust. They have network set up of all sizes, so you can be certain of finding the one that you are looking for. You need to keep in mind that bigger network setups offer more IP addresses but they are also costly. The good thing is that they are worth every dollar.